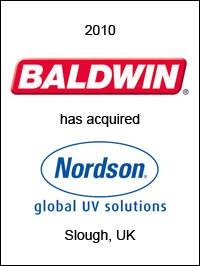 Baldwin Technology Company, Inc. (NYSE Amex: BLD), Shelton, CT, has acquired Nordson UV Ltd. Based in Slough, UK, Nordson UV Ltd. provides UV curing systems used in the graphic arts. Nordson UV Ltd. is a wholly-owned subsidiary of Nordson Corporation. EC Mergers & Acquisitions acted as exclusive financial advisor to Baldwin Technology Company on this transaction.